Friday: Windswept downpours with localized flooding; localized damage in stronger gusts, rumbles of thunder late. Highs around 60. Overnight Friday: Diminishing rain and wind. Temperatures in the 50s. Saturday: Isolated morning showers, then clearing. Early high around 50, then cooling. Sunday: Bright and cool. Highs around 40. Slippery roads and reduced visibility from rain didn’t take long to exact a toll on travelers across New England, with multiple accidents from Maine to Connecticut, and that probably won’t get much better through day’s end. 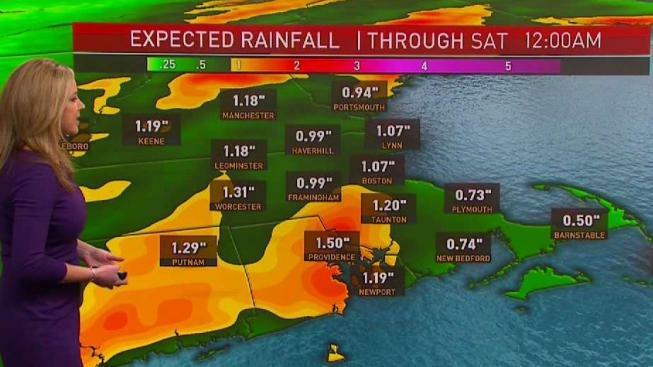 Heavy rain sets up first in central and western New England, then drifts east as torrential downpours and thunder during the late day and evening for eastern New England. With an increasing wind field from the southeast already producing gusts of over 60 mph, scattered tree limb and power line damage will continue into the evening. Any thunderstorms in southeast Massachusetts and Cape Cod could further enhance wind gust speeds, resulting in pockets of localized thunderstorm damage. By late evening, the worst of the rain and wind will be shifting offshore, though scattered showers and an active breeze will continue into Saturday morning, with sprinkles and showers not entirely out of the picture for most of us until noon Saturday, and even then some snow showers may linger in the mountains. Sunday looks cool and bright until an energetic disturbance along – devoid of much moisture – moves overhead Monday morning for some scattered Christmas Eve Day morning snow showers. Although it may be just enough to add some ambiance, not much impact is expected and the snow showers will be gone by midday, yielding to another shot of cool and dry air for Santa’s flight and the Christmas holiday. Our next more significant storm seems to follow the recent pattern of Friday storms toward the end of our exclusive Early Warning Weather 10-day forecast.